Family: Father (name unknown, deceased), Kohaku (younger brother, living). Weapons: Hirakotsu (giant bone boomerang), sword, poison powder, hidden sleeve weapon. Abilities: Enhanced Strength, Speed and Agility. Biography: Sango is a serious demon slayer who hails from a village of professional demon slayers. Sango wields the Hiraikotsu, a massive boomerang made of demon bones, and uses a broad repertoire of tools and tricks to battle demons. Sango seeks revenge against Naraku for the death of her family and her entire village. In addition, Sango seeks to rescue her brother Kohaku from Naraku's influence and somehow save his life, even though Kohaku's life is tied to the jewel shard embedded in his back. She eventually develops romantic feelings for Miroku. Despite the fact that everyone, even Inuyasha, notices her interest, she refuses to admit it exists. 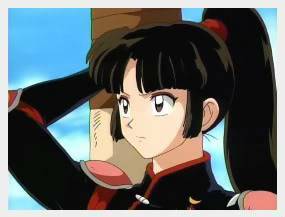 The manifestation of her interest often takes the form of hitting Miroku when he flirts with other single women. Miroku eventually returns her feelings and proposes to her. At the end of the series they are married with three children.